Acclaimed author Lindsey Leavitt brings her trademark heart, humor, and romance to her hometown--Vegas. And then there's Grandpa's letter. Not only is she running the business with her recently divorced parents, but she needs to make some serious money--fast. Grandpa also insists Holly reach out to Dax, the grandson of her family's mortal enemy and owner of the cheesy chapel next door. No matter how cute Dax is, Holly needs to stay focused: on her group of guy friends, her disjointed family, work, school and... Dax. No wait, not Dax. Book in One Word: Fun! From the outside, The Chapel Wars sounds like a book that's super cute and fun. And guess what? It is! This quick, lighthearted read--with a wee bit of depth--filled me with lots of smiles and a few cringes (in that good, oh-my-gosh-what-are-you-doing way). 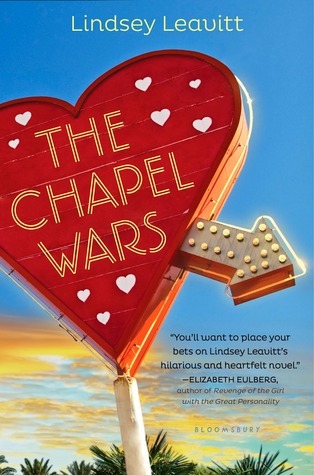 The quirky concept, coupled with entertaining characters, amusing plot points, and the good kind of cheesy-ness, makes The Chapel Wars an enjoyable read. "I would correct you right now, but there are too many things to correct." The story follows Holly Nolan, a sixteen year old who inherits her grandfather's classy-ish Las Vegas wedding chapel when he dies. Even though Holly has always pictured the chapel as a part of her future, she's not exactly sure what to do with it now that she owns it. And of course there are complications, like her divorced parents and her crush on Dax Cranston, the grandson of the chapel's nemesis. Plus, on top of all that, the chapel is in the hole and needs to make money fast, or else they'll lose it. In order to do that, Holly may have to sacrifice some of the chapel's integrity and say hello to Elvis impersonations. "I had hormones, but I also had standards." There's some fun in this novel, but also some seriousness. I liked Holly's POV; she wasn't annoying, and being in her head was pretty bearable--and obsessed with numbers, which was different. Her and Dax are cute together, and their banter was great. What's nice about Dax is that, while he's attractive on the outside, he's not so perfect on the inside, and he definitely has some flaws, which Holly tries to help him through. Holly and Dax's relationship was interesting. While it was more instant than we-are-enemies-we-must-hate-each-other (which would've been quite fun), the two still had issues because of they're families. Their parking-lot-sharing chapels are constantly competing against each other, and that puts a strain on them: their families wouldn't be thrilled with their relationship, and they don't know what to tell and what not to tell about what's going on in their chapels. "I guess it's hard to be the villain without a hero." A great addition to The Chapel Wars was Holly's group of guy friends. They just added this bit of fun and entertainment that I really liked. They were friends, but they were also kind of like protective brothers. (And hey, they may even dress up as a showgirl for you!) Scenes with them had a bonus bit of something extra to them, and that was great. I also liked James, Holly's piano playing, somewhat troubled little brother. Kid's kind of a pill, but he's a fun pill, and I wouldn't have minded seeing more of him. "His adorable. It almost hurt." While this story was surprisingly kind of sad and had a bittersweet ending, it's still really just a quick, simple, cute, and fun read. The Chapel Wars is one of those fluffier contemporaries that wasn't amazing, but it was also better than okay. That said, I liked this book! The idea was fresh and unique, the writing was fine and simple, and the characters were fun and likable. I kind of wish this book fit better to the title--more of a war between the chapels, Dax and Holly "hating" each other more at first--because it could've been even more fun, but still, it worked. And even better, this cover, synopsis, do not disappoint, because dun, dun, dun duuun, here come The Chapel Wars! "The world should wear more sequins." Did I love it? Not really (but don't take that badly). Would I purchase it? Yes--the author will be in town! Who would I recommend it to? Anyone in the mood for something cute, fun, and with a little bit of depth! I really liked this one too! It had a lot of awesome quirks and it made it a lot of fun to read. I liked that it wasn't all fluff though, which made the characters hit closer to home. Also those guy friends reminded me of mine growing up. Heck I still have them all!